Its worst today. I'm tired talking about the haze . I'm sick of reading about the haze. But well, I cant help it. Today while i was on my way to fetch a colleague to work guess what i saw!! OPEN BURNING!!!! !! Was driving so didnt manage to get a picture. These people are really testing my patience. Good thing i don't swear, else I'd probably look into their face and say "FOG YOU". 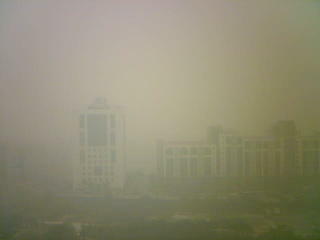 Strange that it was rather clear in the morning but now its just as worst as ever. OK, not gonna ping this one cos i myself also sick of haze news. Can the State government of Selangor declare emergency holiday for all of us tomorrow?? I know the company sure won't do it. Well, just a thought. on a totally unrelated topic....can u pls tell me how u added those ads at the bottom of ur post? here? Fog you? Haa. That's a nice line.